If you didn’t already know, by my endless tweets and Instagram stories. I joined the bandwagon and got a bullet journal. When the whole trend came around, as much as I admired it for aesthetic purposes. I just thought that was as far as it went, and never thought I’d delve into that trend. Being a confessed perfectionist I didn’t dare. However after really looking into it. I’ve come to appreciate the actual system and methodology it has to offer. But how forgiving it is as well. 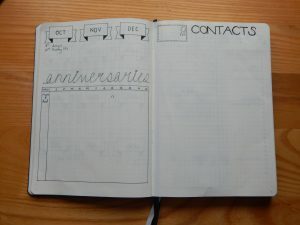 If you want to know thoroughly the whole concept of bullet journals. I advise you go onto their website and read their posts and watch their video which explains it all. But it mainly evolves around rapid journalling, migration and scheduling tasks. I’ve only had my journal a few days. But as it came right at the beginning of February I decided to get it all started quite promptly so I can efficiently use it throughout the month. So I have a general set up. It still isn’t much but it’s a start and thought it’d be good to share a very easy layout I’m going with to help break me into this new system. 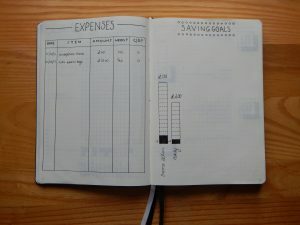 For those who may also be starting a bullet journal, or who are considering it. I decided to get the classic Leuchtturm1917 in black (because let’s be real when have we ever known me to get anything colourful??) which was £19.95 from Amazon. If you’re a stationery fanatic like myself. 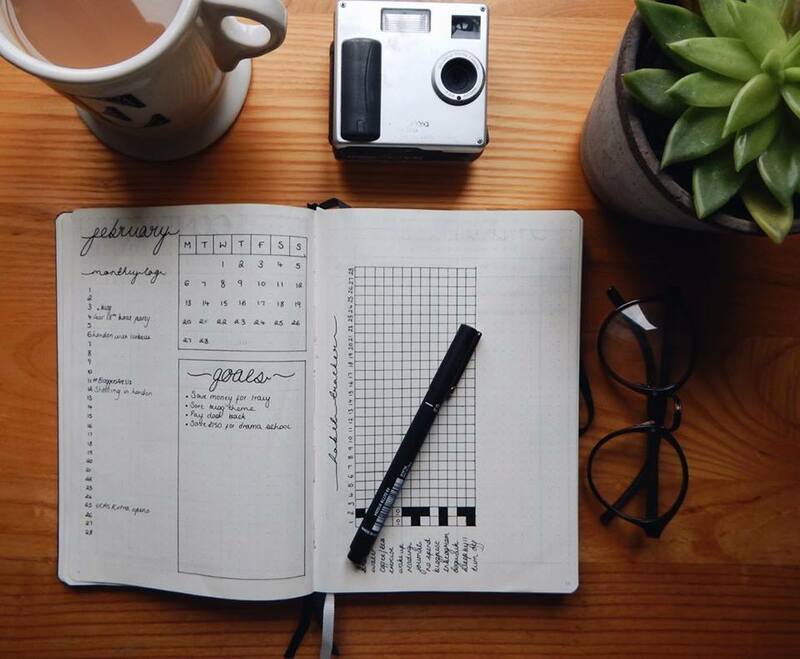 You’ll find this journal so satisfying. Everything about it, the cover, pages, bookmarks not only have charm but are so pleasing. Okay enough with my little journal maunder. I also purchased a pack of Uniball Unipin pens from W H Smiths. In the pack there were 5 different nib sizes: 0.1, o.2, 0.3, 0.5 and 0.8 and only cost £7.99. So perfect if you’re a newbie like me. Obviously you can choose to buy coloured pens or highlighters. Personally I can’t commit to having colour but each to their own. Okay, now to the layout. So we open with the standard bits. Key, index and at the back are some pages explaining the bullet journal which is so helpful! Then we reach my future log, an overview of the year. I’ve done separate months just so I have lots of space to note future events down in case I haven’t got to that month yet. Likewise if you have something to do one month but don’t know what day, you can put it in your future log to refer back to. I then decided it would be a fun idea to draw out a Lunar calendar for 2017 that I saw on Pinterest. And I’m yet to finish it. I am into astrology and it’ll be interesting to have. But I definitely fell into the ‘oh that looks cute and simple’ trap Pinterest gives. Next to it, I have started my birthdays and anniversaries calender. Which is as simple as that. The months laid out to write birthdays specifically and then a table for anniversaries (because, as much as I hate to admit it I am guilty of never remember anniversaries). 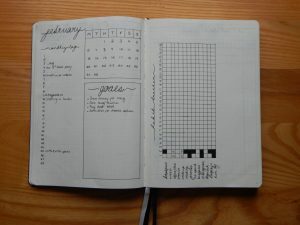 After a simple page which is made for contact details I have my monthly layout for February. I’ve kept it oh so simple whilst I get the hang of journalling. But I quite like the layout just as it is. Nothing unnecessary or fancy as that makes the page busy. I find that slightly counter productive. So I have a little layout in the corner so I know what day I’m on, a list for upcoming tasks and events, and my goals for the months. Then adjacent to this I have my monthly habit tracker. 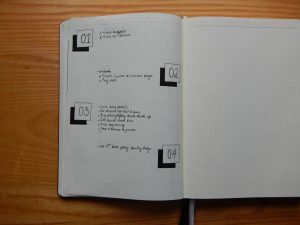 Habit trackers were something that really attracted me to bullet journals. Being something who constantly wants (and needs) to keep track of my health, sleep and other habits. This was perfect for me. 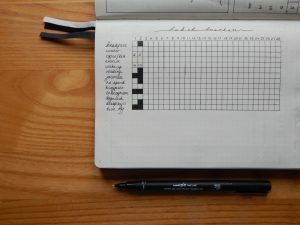 If you are unaware of it, to put it simply its a sort of chart or table, with a list of any habits you want to try and do every day, or want to keep track of (e.g when you woke up or whether you exercised that day). And going across are every day of the month and basically. If say you did work out that day, you’d fill in the square. Then come the end of the month you have a visual reflection of what you are doing and what you need to do more of. This month I specifically want to focus on saving money, for travelling, when I move out and then just general bits. So I have next done an expenses page, for me to write down what I buy, it’s price and whether it was needed, to give me this reflection of what I’m spending my money on. Similarly I have a savings goals page, tracking what money I put away, at the moment I only have that for my trip to Italy and for moving to drama school – I’m still thinking of a good way to track just generally how much I’ve saved. Finally, the start of my weekly/daily layout. Again, very simple just to put events and tasks into – that’s that. The idea of the bullet journal is to write the minimum amount when writing a task or event, no detail explanation of what to do or minor detail, just simply what it is. There’s still a lot I need to do, but so far I am really happy with my bullet journal and my new, personal system. I also want to add some decorative doodles and banners but that’s only for aesthetic purposes. I hope you find inspiration from this (lengthy) post and any if you have any ideas please send them across as I’m constantly looking for new ideas! Ahhhh I want a bullet journal now!!!! Aren’t they just! I love it being so simple, when I was planning I wanted to go crazy because I was so excited but then I just made it so clean which I prefer! Nooo I’m sure it wouldn’t lovely!! See these seem pretty good to me, but it’s having the time to actually make one..I’d love it if there was a workshop for this! !